Can you confirm these amateur observations of Amyda cartilaginea? Populations on the Lesser Sunda Islands and Sulawesi are thought to be introduced (Koch et al. 2008; van Dijk et al. 2012), and this could be also true for Yunnan, China (Kuchling 1995). Type locality: Unknown (fide KING & BURKE 1989); designated as "Java" by Baur 1893: 220. Diagnosis Diagnosis (Amyda): Posterior nares not reduced in size by the inner extension of the maxillaries. Alveolar surface of lower jaw without a longitudinal symphyseal ridge ; seven to eight pairs of pleuralia, all separated by neurals ; a single neural between the first pair of pleurals (fide BAUR 1893). Diagnosis (maculosa). Amyda cartilaginea maculosa differs from the nominotypical subspecies by a more massive head with a relatively short and blunt proboscis, a lighter base colouration (olive to brown instead of dark brown to blackish), the lack of contrasting yellow spotting and less pronounced nuchal tubercles. Juveniles and young adults bear on their back a characteristic saddle-shaped dark mark. In addition, A. c. maculosa is genetically well-dif- ferentiated from all other taxa of Amyda. Comment Synonymy: There has been some confusion between Trionyx and Testudo phayrei in the older literature (see also that entry and references therein). T. phayrei was named after Lieut.-Col. Sir A. P. Phayre, Chief Commissioner of British Birma. Fritz et al. 2014 revalidated Amyda ornata ornata and A. o. phayrei, i.e. Trionyx ornatus GRAY 1861 and Trionyx phayrei THEOBALD 1868 have been removed from the synonymy of A. cartilaginea. Distribution: not in Thailand (incl. Phuket) and other regions of Indochina fide Fritz et al. 2014. 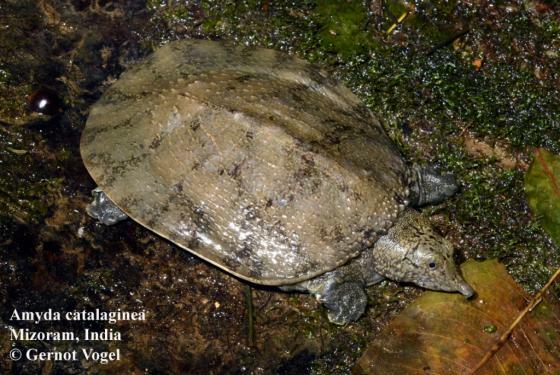 If A. ornata is recognized as valid (not as a synonym or subspecies of cartilaginea) then cartilaginea does not occur in Vietnam, Laos, Cambodia, S Myanmar (= Burma), India (Mizoram, Manipur, Tripura), or Bangladesh. See map in TTWG 2017: 162. Authorship: WIROT NUTAPHAND’s name is not spelled consistently. There are no “official” rules how to transliterate Thai names to Roman letters but WIROT is his first name, and NUTAPHAND his family name, which is usually cited as NUTAPHAND although the author would write his name also as “NUTPHAND” (based on O.S.G. PAUWELS, pers. comm.). Nomenclature: See also MCCORD & PRITCHARD (2002) for a discussion of the name T. membranacea. Type species: Trionyx javanicus GEOFFROY SAINT-HILAIRE 1809 is the type species of the genus Amyda GEOFFROY SAINT-HILAIRE 1809. Bong Heang, Kiew 1987. An annotated checklist of the herpetofauna of Ulu Endau, Johore, Malaysia. Malayan Nature Journal 41 (2-3): 413-423. Meylan, P.A. 1987. The phylogenetic relationships of soft-shelled turtles (Family Trionychidae). Bull. Amer. Mus. Nat. Hist. 186 (1):1-101. Nutaphand, W, 1979. The Turtles of Thailand. Bangkok (Siamfarm Zool. Garden), 222 pp. Van Dijk, P.P. 1992. 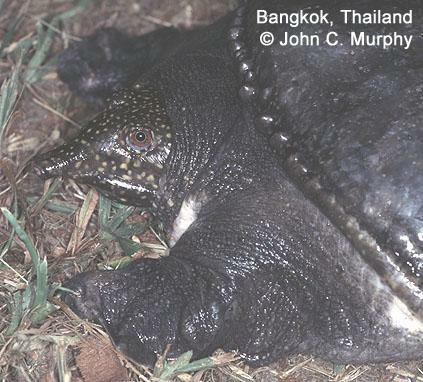 Variation in the Southeast Asian Soft-shelled turtle, Amyda cartilaginea. Master's of Science thesis, National University of Ireland.